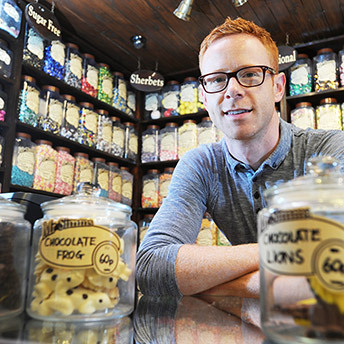 When Ricky Manton took over Mr Simms Olde Sweet Shoppe in the Great Western Arcade, Birmingham city centre, he clearly found his element. The shop is packed from floor to ceiling with hundreds of different jars of sweets, looking colourful and tempting. The ex NHS HR Manager, previously accustomed to working on disciplinary hearings, re-structuring and redundancies, now puts fun at the top of his agenda. “I like to give the shop some atmosphere and make visiting it a pleasant experience,” he says, “so we play different music at different times of day and for particular occasions – ranging from the 1940s to 1980s and more recent nostalgic TV and film sound tracks. I like to see people moving to the music, or humming quietly to themselves as they browse, then making a purchase and going away happy.” Ricky was thinking of refurnishing the shop, but loyal customers say they like the authentic ‘trip down memory lane’ feel of the interior as it is.